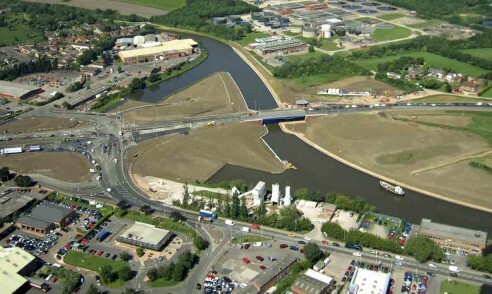 This two lane road swing bridge is located on the Gloucester South West Bypass and spans the Gloucester & Sharpness Canal. 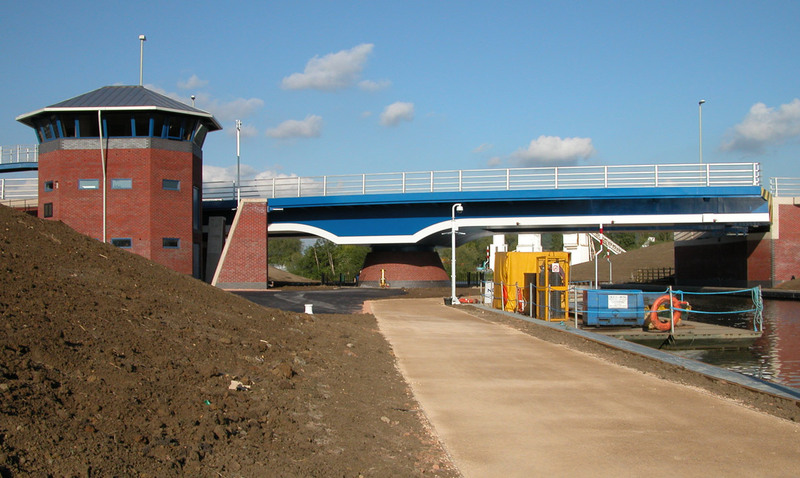 Qualter Hall were employed by the main civil contractor Norwst Holst and the ultimate client was Gloucester County Council, with the bridge being operated and controlled by British Waterways (now Canals & River Trust). Steel construction 43m long and 15m wide, overall weight including ballast 650Te. 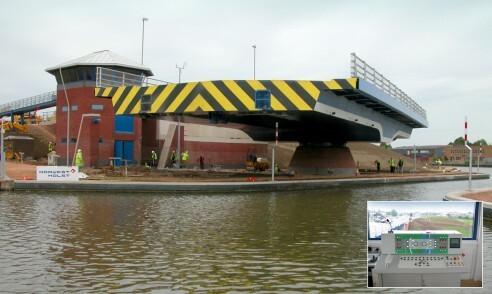 The bridge was manufactured in 15 separate sections suitable for road transport, to enable the complete structure to be assembled on temporary steelwork and finish welded on site. The design includes twin box girders supporting an orthotropic desk plate construction. The main span is 26m and the rear span 17m, with steel and concrete counterweight added to balance the bridge. During normal use, when open to road traffic, the bridge is supported on retractable nose and tail bearings located at both ends. 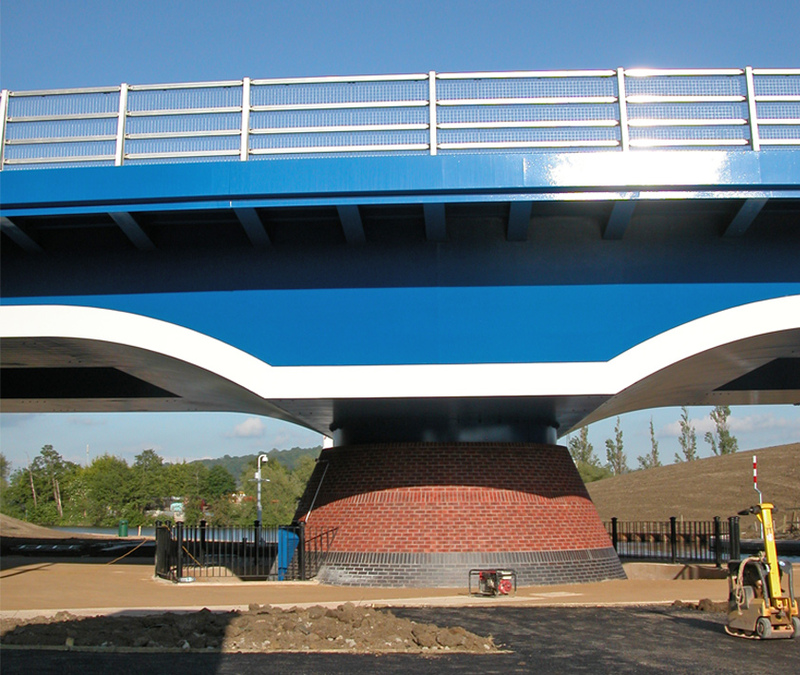 To enable opening for river traffic, a 4m diameter slew bearing allows the complete structure to rotate 90 degrees. The bridge is driven by two hydraulically operated gear units. Two pairs of hydraulically operated jacks are located at both ends to enable the support bearings to be retracted/inserted. The bridge is also locked in position by a hydraulically operated horizonal bolt located below the nose end. The bridge is designed to be operated automatically using the control desk located in the control building and it can also be controlled remotely during maintenance activities. Design and supply of the mechanical, electrical and hydraulic operating and control systems for the bridge. Detail drawings of the bridge. Fabrication and surface treatment of the bridge both in Qualter Hall works and on site. Fabricatio of the mechanical equipment mounting steelwork including the jacks, bearings and nose bolt. 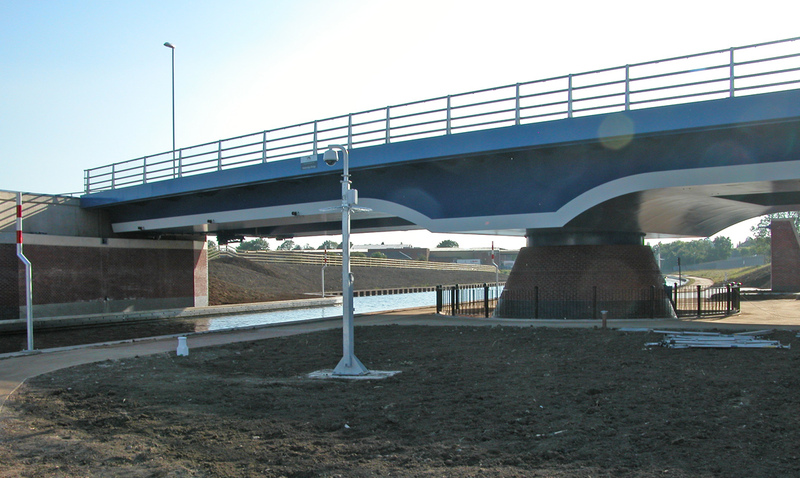 Installation and commissioning of the complete bridge including operating / control equipment, traffic control equipment, CCTV, cabling and hydraulic pipework. The bridge spans over the Gloucester & Sharpness Canal and section of this waterway had to be re-routed and filled in to enable the approaches to be construction to maintain acceptable gradients or road traffic. The canal is frequently used by river traffic, including pleasure cruises during the spring/summer seasons and therefore it had to remain open throughout the construction phase.